It's been a struggle for many sea anglers this Spring. Of course the period from February to March is often a bit slow, to say the least but this year with the persistent cold winds everything seems to be late. I always think that the garden and/or the wild plants are good guides and I reckon many things are weeks later than usual. Anyway, it's no good moaning and for sure you have to keep going or you'll never catch anything. This week I went to the coast twice. I've been desperate to catch something on the fly gear and usually by May I'm hooking a variety of species. However, I tend to err on the side of caution so I take both my fly gear and my spinning rod with me - just in case. My first trip was a bit of a disaster as I mentioned in my latest freshwater blog page. In fact it was so rough that I didn't really fish despite being up and on the coast at the crack of dawn. Undaunted, two days later I set the alarm clock for 03:40 and hurried down to the same spot. This time the surfer's website had got their facts right and it was more or less calm - certainly easily fishable. I arrived just as the first slight glow was appearing on the eastern horizon. 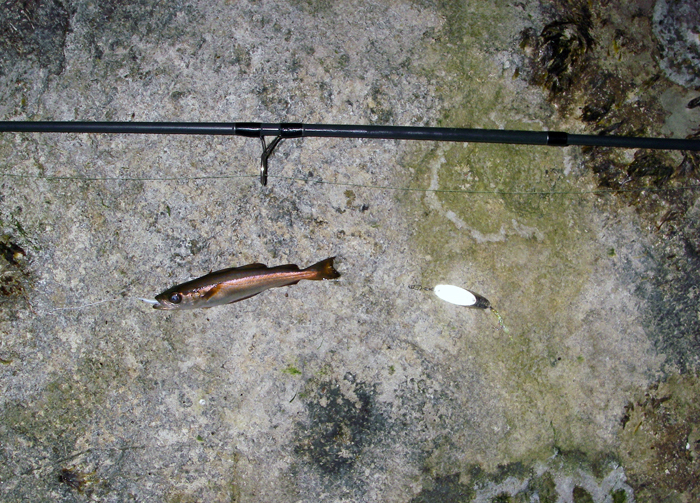 I alternated between fly fishing and spinning (with a wedge and a small teaser) for forty minutes without even a sniff then, suddenly, at 05:20 I felt a slight tap on the spinning rod. I was certain it was a fish. Encouraged I flogged on and five minutes later another tap followed by a slight tension on the line indicated that I had a 'customer'. 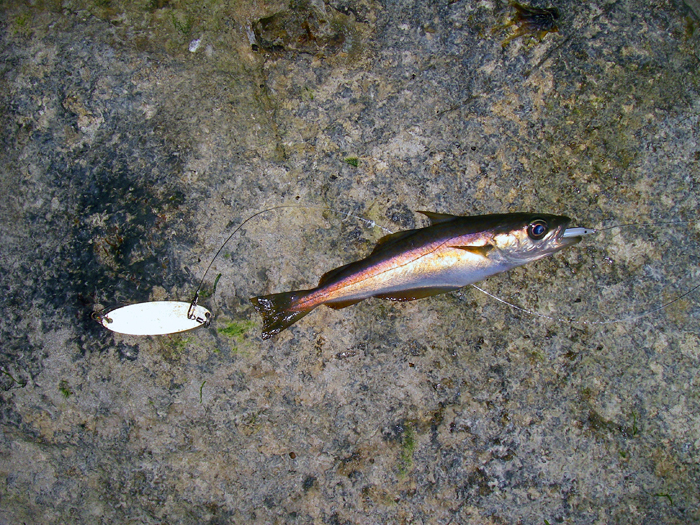 My catch turned out to be a tiny, pollack which had taken the dropper. The fish wasn't just small, it was decidedly skinny. However, a fish is a fish and after recent events I was quite pleased. I fished on and a few minutes later I had another bite which turned out to be another, slightly larger but still emaciated, pollack; again on the Delta eel. Presumably these little fish have, like the anglers, been having a hard time catching a meal in the cold water. My next bite was much better but I missed it. I think it may have been a larger pollack. That was almost the end of my session. I tried the fly rod again and had one more tap before I packed in and went for breakfast. Not spectacular sport but much better than nothing. If it stays warm and calm I expect the next wek or so will see the first bass and possibly even mullet and mackerel taking the flies. Nothing like being an optimist eh?